Along with the fabulous decking products why not add to your property with an MPB fencing system. MPB supply and install a range of stylish uPVC fencing which can transform any home or business. Guaranteed colour stability for 10 years. Semi-privacy and privacy fencing which creates a more secluded outdoor space while still looking elegant and unobtrusive. Available in a choice of 10 colours, click here to see colour range. Available in 3’, 4’ 5’ & 6’ heights. Creates style and accent for your property. Available in range of heights. 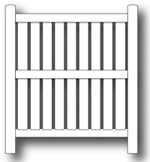 Classic and charming picket fencing, keeping your family and pets safe whilst giving you an unobstructed view of your surroundings and lets passers-by peak at your outdoor perfection. Available in 3’, 4’ 5’, & 6’ heights. Our fencing comes in a variety of different wood types and colours to suit any mix of natural settings.